In 1919, President Woodrow Wilson suffered a massive stroke that left him unable to fulfill the responsibilities of his office just as the country was recovering from World War I. But instead of the vice president taking over as head of state, it was Wilson’s wife, Edith, who stepped into the role, running the government under a cloak of secrecy. A new book argues that Edith should be considered not just a first lady, but America’s first lady president. 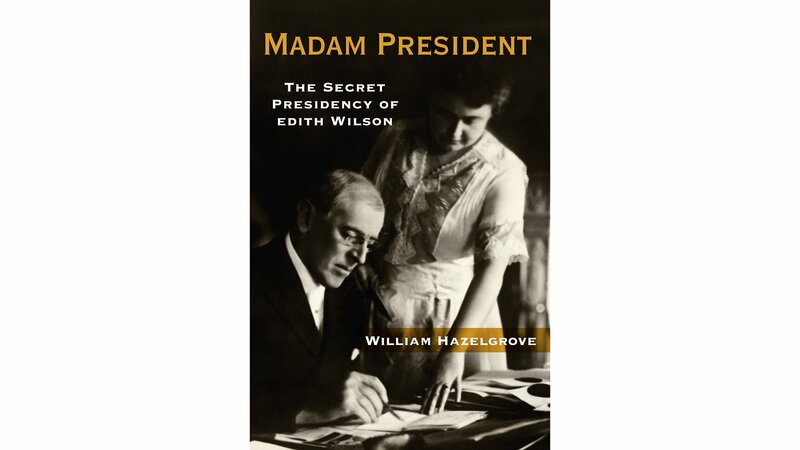 William Hazelgrove, author of “Madam President: The Secret Presidency of Edith Wilson” joins us to talk about the woman who ran the country in secret for two years. Below, excerpts from the book. From there, Edith Wilson would act as the president's proxy and run the White House and, by extension, the country, by controlling access to the president, signing documents, pushing bills through Congress, issuing vetoes, isolating advisors, crafting State of the Union addresses, disposing of or censoring correspondence, and filling positions. She would analyze every problem and decide which ones to bring to the president's attention and which to solve on her own through her own devices. All the while she had to keep the fact that the country was no longer being nm by President Woodrow Wilson a guarded secret. Many Americans are still surprised to learn that President Wilson suffered a massive stroke while in office, but what they find totally inconceivable is that his wife, Edith Wilson, was the acting president for almost two years. To acknowledge this would be to diminish Woodrow Wilson's legacy. Power is given to those who can wield it, and President Wilson, who remained in bed only to be wheeled out for movies and some fresh air, was virtually powerless. The question then is: who was Edith Bolling Wilson? Was she a woman singularly gifted enough to run the country and nurse her husband back to health? Or was she a woman doing the best she could in a world in which women were seen as little more than second-class citizens? But Cupid wouldn’t rest even for impending war. "My happiness absolutely depends upon your giving me your entire love," he wrote Edith. He was wound up by Edith’s indecision and that night stepped out of the White House as if he was going to walk over to her house. Woodrow Wilson was realizing that Edith was a formidable person to have on his side. She could hold a grudge better than any man he knew. He gently suggested that Bryan wasn't the traitor Edith made him out to be, but she did not back down, saying, "You are a fencer so worthy of anyone's steel that fencing becomes a delight. . . but you have my heart on your side-which is a tremendous handicap to me . . ."
The problem for Woodrow and Edith, as for many new lovers, was getting time alone. There was always Secret Service agent Starling in the back seat or the chauffer in the front seat. They took long drives where the curtains were pulled while they hugged, necked, and probably more. Wilson's wife had died less than a year before and they had to be discreet. Woodrow Wilson was a very sensual man and made the best of a bad situation. The letters reveal what went on behind the curtains. Things culminated on May I 0, 1915, when they told each other they were in love. Cupid triumphed and they became secretly engaged. Edith's training continued as she received bundles of state papers that Wilson commented on. This included a draft of the final note to the Germans over the Lusitania. The forty-three-year-old Edith read all of it and gave the president her opinion. On August 13, she wrote Wilson from Geneva, New York, "!felt so queer this afternoon reading all these reports from different theatres of war, sitting here in my quiet room, away from everything, in a tiny little tow n beside a calm lake . . . I–an unknown person, one who had lived a shelter inconspicuous existence." The president responded by saying "whatever is mine is yours, knowledge of affairs of state not excepted." This is an extraordinary statement for a president, but power is an aphrodisiac, and Edith Galt was clearly attracted to the power of the presidency. On August 24 Wilson sent a large envelope and told Edith it contained shocking news from their consul Snodgrass in Moscow. The Russians were abandoning their defenses and the government was on the run. The Russian Revolution had started and Edith Bolling Galt could say she knew first. Today, we might believe this to be a violation of secrets of state. But Woodrow Wilson wasn't a man who stood on protocol. He routinely used other people as sounding boards. Edith was a lover, confidant, and advisor all in one. Wilson probably thought he was having his cake and eating it too. He would have never imagined that he was grooming Edith Galt for his seat of power. Edith Wilson’s presidency was short–less than two years–but it was groundbreaking. Woodrow Wilson after his stroke could not perform the duties of the presidency and Edith stepped in to fill the role. Edith's guiding principle as president was to keep her husband alive by taking over his job and restricting access to him. Edith’s presidency fits the constitutional definitions of the duties of president. The Constitution defines the president’s first role as commander-in-chief of our military. World War I had just ended but the peace had not been settled. Edith was in the middle of the negotiations to get the Treaty of Versailles ratified and to implement the League of Nations with the United States as a member. Edith exercised five out of the six duties of the presidency. But history is not just facts. It is an accumulation of events and circumstances that interact with individuals upon the grand stage of life. Verisimilitude is by definition that which appears most true, but it is only through the exigencies of shared experience that we see truth. It is the journey after all and not the destination that matters most. It is hard for people to believe the United States had a woman president in 1919. Back then, women didn't take over struggling jewel ry businesses or buy and drive cars, certainly not women who had only two years of formal education. But Edith Wilson did all of these things. We cannot know exactly what transpired in the Wilson White House, but since communications were by letters, there is a paper trail that gives us an indication. It is in those letters that we see Edith Wilson's involvement in running the United States from October 1919 to March 1921. And now, at the time of this writing, just under a hundred years later, we are faced again with the prospect of our first woman president. Edith Wilson was never nominated, she was never on any ballot, she never took the oath of office, but she did carry the burden of presidential power from 1919 to 1921. She has never been given credit for stepping in during a national emergency and steering the ship of the United States through turbulent waters. Edith Wilson never sought any acknowledgment and in fact made a point of saying she was not the president. But she did rule and she found out the limits and the heartbreak of that power. Edith Wilson 's presidency should be studied closely by the next woman president. Like the Wright brothers' first experimental flights, it was rough and short, but it left behind experience and much to learn from. The next flight will be longer and will tell us even more. After all, experience is the best teacher, and Edith Bolling Wilson, when it was all said and done, was our first woman president. Nov. 9: “I know how disappointed you feel because I feel it too, and so do tens of millions of Americans who invested their hopes and dreams in this effort,” Hillary Clinton said to supporters Wednesday. Oct. 31: Serving in the military can be dangerous, frightening and unpleasant – sometimes in ways you might not expect. How the military tackles loud sounds, bad smells and upset stomachs. Oct. 25: When is less more? A new book highlights the pros and cons of parents who hover, even into college.